It's going to be a long wait for Marvel's Ryan Coogler-directed Black Panther, which features a star-studded cast of acclaimed actors. So, why not brush up on a few facts about the feline character who you will no doubt be hearing a lot more about. If you’re like me, you’re still basking in the glow of Netflix’s Luke Cage. Love it or hate it, that series was one of the blackest shows on TV in a very long time. From the characters, to the extras, to the cameos, to the soundtrack, to the subplots, to the sociopolitical commentary, Luke Cage was nothing if not black. Personally, I’m guilty of putting Cage on auto-play with the TV muted as I do work. It’s somehow comforting to look up and see a screen full of beautiful black people. I had some issues with a few things and I’m not sure I agree with all the casting choices but, overall, I dug it. And, probably, so did you. Which means there are many of us waiting anxiously for the NEXT black-love-fest on the silver screen. Black Panther isn’t supposed to drop until February of 2018 (according to IMDB), so unfortunately, we’ve got a lot of time to speculate about how it will turn out. To help us pass the time, here’s a list of eleven things we know about Black Panther so far. 1. The Black Panther character first appeared in July of 1966 as a cameo in a Fantastic Four comic book (#52). For historical context, this was about a year after the Watts Riots were ignited by an incident of police brutality against a 21-year old black man. Those riots resulted in a number of deaths in the Los Angeles area. 2. Black Panther was created by Stan Lee, the prolific former president of Marvel Comics. Lee briefly changed the character’s name to Black Leopard to avoid association with the then-controversial Black Panther Party but the new name didn’t stick. The Black Panther character pre-dates the real life Black Panther Party by only three months. 3. Black Panther was the first African-American superhero in mainstream American comics. Black Panther predates Luke Cage by 6 years but came a full 28 years after Superman was introduced in 1938. 4. Black Panther is the king and protector of Wakanda, a fictional country in Northeast Africa. Wakanda is one of the wealthiest and most technologically advanced nations on earth. This is a result of the fact that Wakanda was never colonized and the fact that they are the only place in the world that has possession of Vibranium, a precious, extraterrestrial resource. 5. Wakanda was once the site of a meteorite crash. Later, the Wakandans discovered that the meteor was made out an ore that can absorb sonic vibrations (Vibranium). After British invaders tried unsuccessfully to seize the Vibranium by force, the Wakandans came to understand its value and started to sell small amounts of the material to fund their country’s technological development. 7. The title “Black Panther” is a rank of office, i.e. the chief of the Wakandan Panther Clan. In other words, it’s a title, not a name. The current Black Panther is named T’Challa. He succeeded his father King T’Chaka who held the position before him. There are several clans in Wakanda but the Panther Clan is the most powerful. This clan prays to the Panther God in deference to the local feline predator. 8. Actor Chadwick Boseman played the Black Panther in Captain America: Civil War. He will reprise his role in the upcoming movie in 2018. FYI, Wesley Snipes tried to produce a live action version of the movie in the 90s. 9. The Black Panther was married to Storm (Ororo Munroe) of the X-Men. According to comic book lore, the two dated briefly as teens before getting married much later as adults. The fact that the Black Panther is an Avenger and Storm is an X-man creates some issues between the two of them. Later, when a fight between the X-Men and the Avengers results in the destruction of Wakanda, the two of them have major drama and their marriage is annulled. 10. The Black Panther was produced as an animated cartoon series that appeared on BET in 2011. Djimon Hounsou did the voice for the main character and Jill Scott performed the voiceover for Storm. The series also made use of the vocal talents of Alfre Woodard and Kerry Washington. 11. MacArthur Genius and National Book Award-winning writer author Ta-Nehisi Coates was invited to write an 11-issue series of Black Panther as a reboot for Marvel. “First of all I think there are very, very few African-American heroes, period. 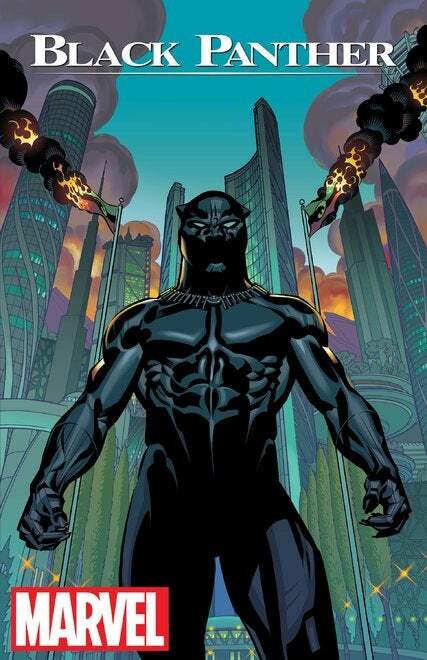 Certainly African heroes like T’Challa,” said Coates about his Black Panther project in a Gizmodo interview. “I understand the need, particularly among black fans, to see T’Challa be a certain type of way, even to see him restored to a certain place. This is, like, in my bones. I feel a deep responsibility to history.” The first in the Coates series hit comic book stores in September 2016 and it has been flying off the shelves.